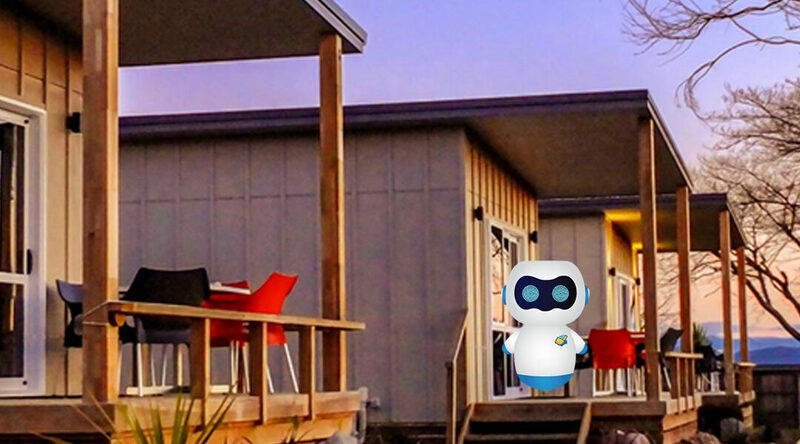 New Zealand business, Taupo DeBretts Spa Resort is the first RV park worldwide to receive reservations via artificial intelligence interacting directly with their guests. Owners Barry and Carol Kirkland jumped on the opportunity to pilot NEW.B.I.E, an artificial intelligence guest assistant that can assist guests with hundreds of tasks, from accommodation reservations, gift vouchers and add-ons, to Wi-Fi, the weather, directions and much more. In August, two of NewBook’s developers travelled to Taupo for on-site research and development with Mirela Petrar, Operations Manager, listening to how guests interact with their staff and training NEW.B.I.E, just as you would train any other staff member. Mirela thinks NEW.B.I.E is “the beginning of something that’s really exciting”. The Kirklands, who take a futuristic approach to their business, have developed several innovations of their own to increase efficiencies across their resort and their desire to step outside the box and stay ahead of industry trends makes NewBook a perfect fit for their property. “Embracing technology has allowed us to grow our business exponentially and we are always looking for new ways we can further automate operations to maximise efficiencies in all areas of our business. We’ve seen such an incredible amount of change over the last 10 years and for us it’s all about being able to do business at the speed of thought”. Barry was delighted to be the first property to start using NEW.B.I.E and says NEW.B.I.E has already become an asset to the team, confirming its first reservation and gift voucher sale in its first two days of employment. The Resort’s first confirmed artificial intelligence reservation was taken on a Sunday afternoon during a busy check-out period and only took the guest three minutes talking to NEW.B.I.E – much faster and more convenient for both the guest and the resort! Taupo DeBretts is a popular destination for overseas visitors, especially Chinese guests. Their website and NewBook’s online reservation engine are both translated to Chinese in addition to NEW.B.I.E speaking Chinese, so their ability to receive direct commission-free reservations is vastly increased. The Kirklands are pleased to see how this technology is already paying massive dividends for their business.